This is a fun middle grade book. Cody, Quinn, Luke and M.E. love codes and have created the Code Busters Club. They have a secret club house and communicate with each other using different codes, including sign language (which they learned because Cody’s little sister is deaf). 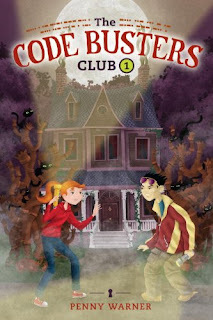 Noticing a coded message from a neighbor, calling for help, the Code Busters use coded messages to solve a crime. I love how this book encourages kids to learn different ways to communicate (it even embraces the language of children today, texting). Mixed in with the story we find codes for the readers to unravel (don’t worry, there is a key at the back of the book) so the story becomes interactive. Kids will easily be able to relate with the characters, and enjoy sharing their adventures by helping crack the codes. The idea of communicating via code brought back memories for me. Back in High School, a good friend created a code (utilizing small shapes and images in place of the alphabet) and we used it to pass notes back and forth. Our logic was that if we got caught passing notes, our teachers would have no idea what we were saying! (Honestly, we were pretty good kids who had to find our own little ways to rebel. Our notes usually related to pretty tame things like where we were going to meet at lunch or when the next church dance was taking place). It was so much fun to have our own coded means of communication. We got pretty good at both writing and reading it with out our answer keys (which we, much less creatively than the characters in the Code Busters, had written down on 3X5 cards). If you are looking for a fun book (and soon to be series, the next adventure being alluded to at the end of this book) for your middle grade reader, look no farther than The Code Busters Club. Can one teen really survive on her own? Desperate to find out what happened and to avoid the Changed, Alex meets up with Tom—a young army veteran—and Ellie, a young girl whose grandfather was killed by the electromagnetic pulse. We are accepting five readers in the U.S. for this ARC tour on a first come first serve basis. For a full list of Fire and Ice ARC tour rules and to sign up click here and fill out the form. Bryn is now leader of the Cedar Ridge pack of werewolves and she’s convinced that her pack is different – it’s democratic and fair. Then Bryn finds a battered teenage Were, Connor, bleeding on her front porch. He begs Bryn to protect him from an abusive leader; Bryn takes him into her pack. But Bryn’s Were partner Chase doesn’t trust the new boy, and the more time she spends helping Connor, the more aggressive Chase becomes. Bryn is not sure if it’s jealousy, or Were possessiveness but for the first time she starts to feel suffocated by the bond she and Chase share. 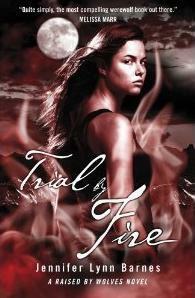 Filled with action, unlikely allies, and deadly conspiracies, Trial by Fire will change Bryn forever. She is soon to realise that to lead a pack of werewolves, she must give in to her animal instincts and become a little less human. And as hard as it’s going to be, Bryn is going to have to do it alone. Trial by Fire, installment two of the Raised by Wolves series begins with Bryn as the new Alpha of the small but strong Cedar Ridge Pack. Bryn is very unusual, because not only is she female, but she is a human and her pack is werewolf. Things become complicated for the new Alpha when a foreign wolf, Lucas stumbles across the border and lands on her doorstep asking for refuge. He’s badly wounded, having been abused by his captors, but Bryn is torn between having compassion on the rogue wolf and protecting her pack from the consequences that will occur if she allows him to stay. Werewolf politics won’t allow Bryn to rely on Callum anymore for advice. And, her main rival Shay of the Snake Bend Pack is testing the limits of territory borders plus claiming ownership of the rogue wolf. Will Bryn be able to maintain her position as Alpha when it seems several members of the Council are just waiting to see her fail? What about the new added threat which is so unlike anything she has ever faced before…a coven of psychics. What I really love about this series is the driven, focused plot centered around the mentality of a pack of werewolves. The writing gives readers a chance to really step in and feel what the dynamics inside the group. You feel like you are a part of the pack. You hear the inner dialogue and feel what Devon, Lake, Maddy and the others might feel. In Trial by Fire, we also get a lot of interesting back history on Ali, Bryn’s foster mother, and we see Bryn pushing back against Ali’s desire to exercise authority over Bryn as she has in the past. Bryn is definitely the Alpha now and won’t take much from anyone who steps up to challenge her. Jennifer Lynn Barnes creates characters that will stick with you long after you’re done reading. They are well developed and each unique in their own right. Devon is one of my very favorites with his funny sense of humor and undying loyalty to Bryn. (Now we just need to find him someone special in book three!) I also wish we would see more of Chase and Bryn together, but I understand she is so busy fighting for her pack there’s not a whole lot of time for romance. This is an intriguing werewolf series which is unique and well thought out by the author. I’m curious to see where the series goes from here as it seems Bryn has faced so much opposition already! Thanks so much to EgmontUSA for the early chance to read book two. Learn more and view the new book trailer by visiting Jennifer Lynn Barnes website. Content: Abuse and violence. Recommended for readers 16 and older. 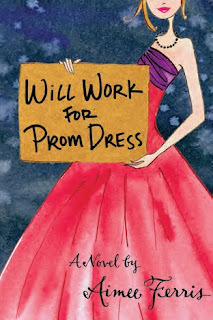 Quigley Johnson has, reluctantly, given up the rest of her last year of high school to take part in her best friend Ann’s Betterment Plan, which will turn them into the best-dressed, most sought-after, most admired girls at their senior formal. Because – hey – who doesn’t want the perfect prom, complete with a dream dress and a devastatingly handsome date? But the prom costs money – lots of money – and even though the girls could easily have Ann’s mom design their dresses (she’s only Victoria Parisi, one of the most famous designers in the world), Ann insists that they pay their own way. And that’s how Quigley gets stuck making artistic topping masterpieces on frozen pizzas canvases, before becoming a live model for Ms. Parisi’s fashion design class, where she meets Zander. He’s cute, and cool, and funny, with a killer design sensibility (even if he can’t sketch). But is he too good to be true? And what about David, the hot, talented artist at school, who’s also kind of a jerk, but won’t leave Quigley alone? And Ann – she started the Betterment Plan to improve Quigley and herself, but it seems like it’s ripping their friendship to shreds. This road to the prom dream may just end in disaster. Quigley and Ann are in their last year of high school and on a mission to improve themselves just in time for prom. Their Betterment Plan includes eating right, exercise and plenty of off the wall jobs to pay for the perfect dress. The girls find themselves in a frozen pizza factory making artistic creations with sauce and pepperoni, sitting in as the dead man at a mystery murder dinner and even part of a float in their local parade. Quigley always seems to get the short end of the stick in every finagled job, so she is hesitant when Ann’s world famous designer mom, Victoria Parisi, offers them a gig as models for her fashion design class at the local college. Quigley is everything your average student, not overly concerned with her body or standing out. So it’s no surprise when her perfect beautiful friend Ann lands all of the votes for first pick as model in the class. Zander sides with Quigley and in his humble sincere way slowly wins his way to her heart. Meanwhile, Ann is busy with Lance, the Spikester, who has a past of his own. But both design class boys have competition awaiting them at the High School. As a reader you’ll never know until the very end if Ann picks T-Shirt, the local rich boy who wears his daily motto on his tee or if Quigley will turn arch nemesis self-proclaimed art King David into more than just an enemy. Teaser Tuesday is weekly meme hosted by Mizb at Should be Reading. Grab your current read. Open to a random page. Share two “teaser” sentences from somewhere on that page, be careful not to include spoilers. Share the title & author, too, so that other participants can add the book to their TBR Lists if they like your teasers! My Teaser Tuesday is Drought by Pam Bachorz. I spent all day yesterday reading it with constant rain and snow showers outside my window. 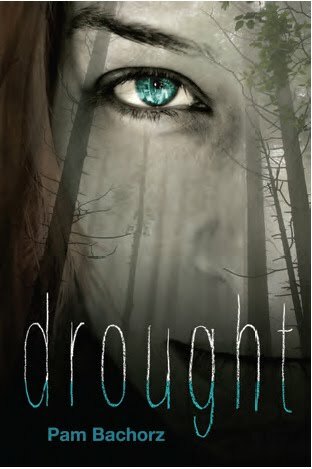 Drought is coming January 25, 2011 from Egmont USA. Learn more here. In My Mailbox is a bookish meme originally started by The Story Siren. Every week we’ll post about what books we have received that week (via your mailbox/library/store bought). The idea of In My Mailbox is to bring books to the attention of our blog readers and to encourage interaction with other blogs. This week here’s what’s in my mailbox…. 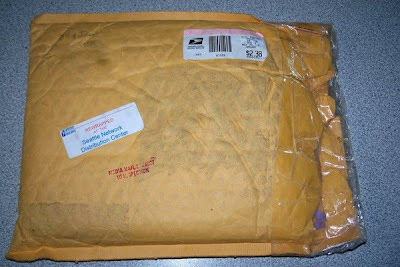 And Mr. Fed Ex delivered a box of items for reviews and giveaways from Deseret Book. They were so kind and generous! Look for reviews on all of these titles coming soon. And thanks again to all of the publishers and authors who sent mail this week. I’m giving away an author signed copy of Shadowed Summer by Saundra Mitchell to our readers! Simply comment below with the title of a book you have on your wish list and you’re entered to win. Contest ends November 30, 2010. Last year I read the Dark Divine and was introduced into the world of Bree Despain which inspired me to create a ton of jewelry, make 10 blog posts and follow her around to several signings to learn more. I dare say I fell in love with the music playlist, the amazing cover and Daniel. This year we saw the ARC for The Lost Saint up for auction at the Writing for Charity event and yearned to read number two in the series. So, I have to thank Jennie B and EgmontUSA for sending the uncorrected bound proof. You guys rock! The Lost Saint picks up as Grace has just lost her brother Jude since he bit her and infected her with the curse of the wolf. Grace’s mom is in a deep depression and the household is in chaos as her dad is scouring the country for signs of Jude. He hopes to bring their Prodigal Son back home to the fold. Their town Rose Crest is steeping with a rash of crime with no evidence of who could have created such destruction other than the old Markham Street Monster. The first few chapters things are beautiful between them. I fell in love with their chemistry in The Dark Divine. But soon things start to grow a little complicated. Here’s where I should say that I am not a patient reader so sequels are sometimes harder for me to read. (I was not much a fan of New Moon in the Twilight series) Transition and change are rocky. The Lost Saint also felt a titch darker in parts than The Dark Divine as Grace is battling her choices. You’ll see a whole new side to everyone you are familiar with. My favorite part of the book…loads of new characters! Grace meets the new hot man in flannel, Talbot. You will love him. Majorly swoon worthy and a hunk of man. He is my favorite new character of the series. The fun part as well, characters you may recognize! That’s right… bloggers make cameo appearances in the book. Super cool. Katie Summers (KatieB) from Mundie Moms, blogger Debbie CranberryFries and Stacey C from PageTurners Blog all are in there. As well, there are lots of other names I didn’t personally recognize, but many of you may be able to pick them out. We can’t give away much more because this is an action packed novel and we have to save you all from spoilers. I dare say followers of Bree won’t be disappointed. 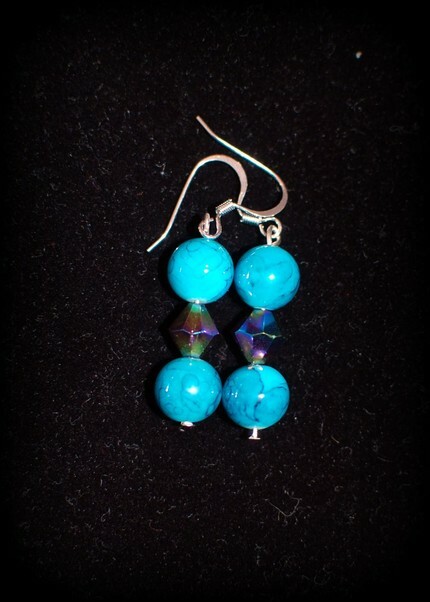 Comment below for a chance to win one item of your choice from the Bree Despain or Wolf collections on Etsy. Let us know what you’d like to win! 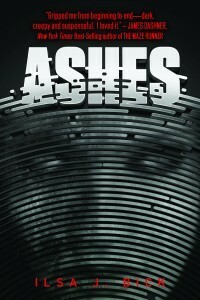 Giveaway ends October 24, 2010 and is open internationally. Our Waiting on Wednesday is Hourglass by Myra McEntire, twitter peep extraordinaire! She is one of those people who will make you smile, so we can’t wait to read her debut novel. Head on over and follow her blog here. Description from the Publisher’s Marketplace listing: “Myra McEntire’s debut HOURGLASS, a timeslip romance in which a girl who sees ghosts meets a boy who knows the truth about what her visions really are, and he alone can unlock the secrets of her past, to Regina Griffin at Egmont, in a two-book deal, by Holly Root at Waxman Literary Agency (NA).”It will also be published in Germany by Random House and in Brazil by Record. 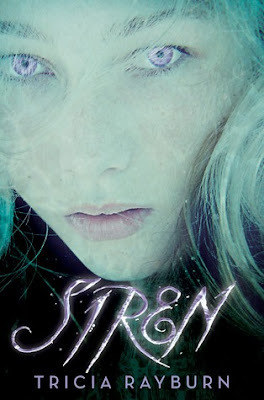 Today’s Author Interview is with Tricia Rayburn as a part of her blog tour for the book SIREN hosted by Hooked on YA books. Where did the inspiration from Siren come from? Siren was inspired by my recently developed fear of all creatures of the deep. I grew up swimming in the Long Island Sound, but for some reason, I now won’t go deeper than my knees in any natural body of water. I’m too afraid of jellyfish, crabs, sharks, you name it! 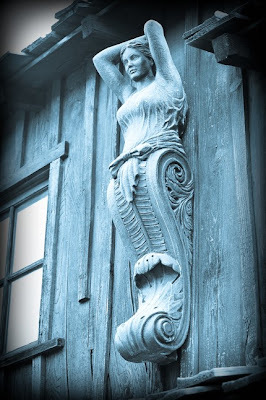 This made me think about what else might be lurking beneath the surface, and Siren grew from there. Have you ever been to a place that reminds you of Winter Harbor? Yes! I’ve actually never been to Winter Harbor, which is a real town in Maine, but I imagined much of it to look like various places I’ve visited in New Hampshire. The lake Vanessa’s family has a house on, for example, was based on Lake Kanasatka, where my family and I have spent quite a bit of time. Any swoon worthy men that inspired the two main men in the book Siren? Simon’s a conglomerate of every smart, sweet, somewhat shy boy I’ve ever known—because those were the ones I was always drawn to, which made Simon that much more fun to write! What are your favorite treats/ munchies? Writing in the summer months is always easier with iced coffee or some other cold drink nearby. When the weather cools that will probably change to hot tea or, even better, hot chocolate! Is there a sequel planned and when is its release date? Yes, Siren 2 (official title TBA!) will be released next summer, and Siren 3 will be released the summer after that! Thanks so much to Tricia for stopping by our site and answering our interview! Giveaway ends September 4, 2010, Good Luck! What is up with the mail? I have learned a lot this week. Mainly that delivery confirmation is worth the 80 cents extra for peace of mind. Just this month over $400 of jewelry orders and books have been lost or stolen. YIKES! No more trusting my postal workers! Thanks to those of you who have emailed us to let us know you received your prizes! More coming soon! Email us if you are interested in reading and reviewing any of these books on your site. Must be willing to ship with DC and send us the link to your review. Thanks!